Jakarta, Indonesia – Joko “Jokowi” Widodo is on track to win a second term as Indonesia’s president, with quick count results indicating a 10-point lead over long-time rival Prabowo Subianto. Jokowi said that “let’s be patient and wait for the official Electoral Commission results”. While results won’t be certain for weeks, the day went smoothly across Indonesia – an archipelago of thousands of islands. With over 800,000 voting stations, 187 million eligible voters, and five million election staff, these are the world’s biggest one-day elections. 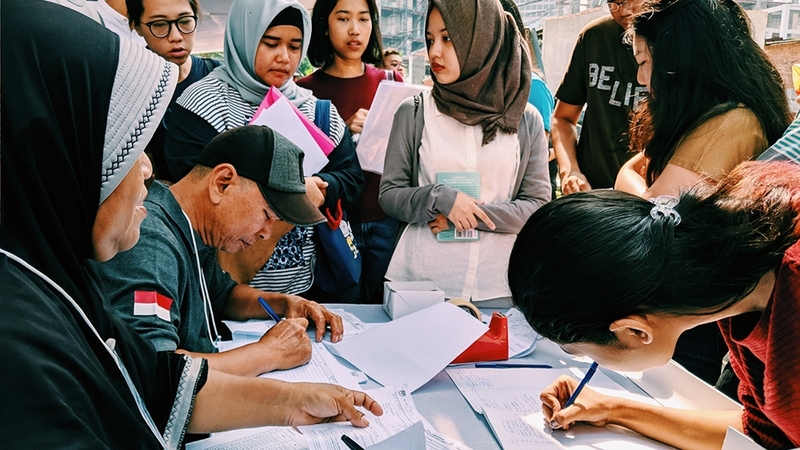 In Kebon Kacang, central Jakarta, voters were split nearly down the middle. Three of the six polling stations were won by Jokowi and his partner Ma’ruf Amin, and three by Prabowo and running mate Sandiago Uno. Jokowi-Amin received 713 votes across the six stations, and Prabowo-Sandi 673 votes. Queues began forming as early as 6.30am in Kebon Kacang (23:30 GMT on Tuesday). Voters munched on fried tofu or drank curry soup as they waited, and children ran about playing, giving the area a festive feel. It is not without reason that Indonesians refer to election day as a “democracy party”. “I’ve been here since this morning,” said Ivone Whie, a Jokowi supporter. “I wasn’t able to vote for 12 years because I was outside my home area, so I’m very excited to vote this year.” Ivone was optimistic that Jokowi would continue as president, but told Al Jazeera with a laugh that both sides were confident of a win. Prabowo’s team has repeatedly said that they will protest in the streets “if the vote is stolen”. Smallgoods kiosk owner Juardini shrugged off the idea of protesting. “The important thing is that everything goes peacefully,” she said, adding that she voted for Prabowo-Sandi. “Prabowo-Sandi will reduce the price of basic foodstuffs,” she explained, waving at a neighbour. “Recently, the prices have gone up,” she said as the women sitting either side of her nodded in agreement. Jacob said she believed that the economy is a very significant factor for voters, echoing Juardini’s concerns. “The weakness of the rupiah, concerns over the rate of economic growth, and a growing current account deficit, has given the opposition something substantive to criticise the administration,” Jacob explained. “I’m really frustrated,” young voter Pipit told Al Jazeera, holding her official voter letter in her hand. “My letter told me to come to this polling station, but now they tell me my name is not on the list and that I have to wait [to vote as an additional voter] until after mid-day.” She is worried that they would run out of ballots before then. Indonesia’s elections are not only some of the world’s largest, but also the most expensive. Finance Minister Sri Mulyani reported that the government had allocated 24.7 trillion rupiah ($1.75bn) for 2019’s elections.